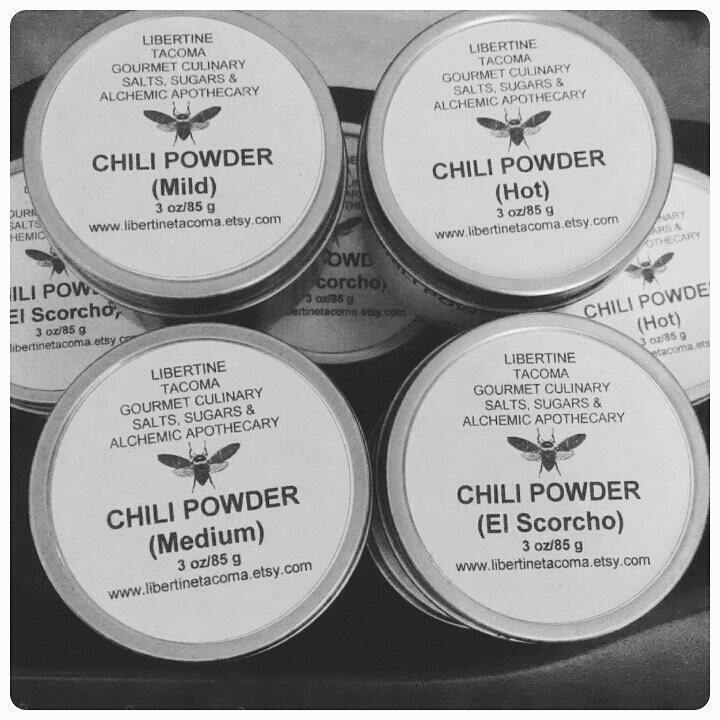 I have created 4 delicious and complete chili pepper blends for seasoning your favorite recipes! They range from mild heat to over the top scorching hot heat. There is is a simple recipe on the bottom of each tin. These blends are great for not only seasoning your favorite chili but also, making homemade tortilla chips, seasoning cream cheese for dips, making sauces for vegetables, homemade crackers, popcorn and whatever else you want to add some spiciness to! INGREDIENTS: Ancho Chili Powder, Cumin, Garlic, Onion, Mexican Oregano, Coriander, Tellicherry Black Pepper, Himalayan Pink Salt. INGREDIENTS: Aji Panca Pepper Powder, Aji Amarillo Pepper Powder, Anaheim Chili Pepper Powder, Garlic, Onion, Cumin, Mexican Oregano, Coriander, Tellicherry Black Pepper, Himalayan Pink Salt. INGREDIENTS: Ancho Chili Powder, Cumin, Garlic, Onion, Mexican Oregano, Coriander, Cilantro, Tellicherry Black Pepper, Habanero Powder, Himalayan Pink Salt. INGREDIENTS: Ancho Chili Powder, Cumin, Garlic, Onion, Mexican Oregano, Coriander, Cilantro, Tellicherry Black Pepper, Habanero Powder, Ghost Pepper Powder, Himalayan Pink Salt. These blends are packaged in a 4 oz rust resistant tin and are easy to use. All ingredients are natural, pesticide free and as fresh as can be. Available in a variety of sizes.